Դավիթ բեն Գուրիոն հրապարակ՝ վայր, որտեղ եղել է տունը, ուր նա ծնվել է, Պլոնսկ, հյուրանոց Վսպոնա փողոցում. Դեյվիդ և Պաուլա բեն Գուրիոն, հունիսի 1-ին, 1918 թ.
Բեն Գուրիոնը իր հիշողություններում գրում է իր հայրենի քաղաքի մասին. 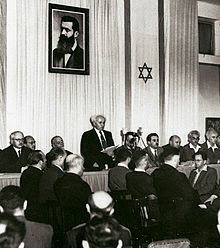 ↑ 1,0 1,1 1,2 חה"כ דוד בן-גוריון (גרין) — Knesset. ↑ 6,0 6,1 6,2 Бен-Гурион Давид // Большая советская энциклопедия: [в 30 т.] / под ред. А. М. Прохоров — 3-е изд. — М.: Советская энциклопедия, 1969. ↑ 8,0 8,1 כל ממשלות ישראל — הכנסת. ↑ 9,0 9,1 9,2 9,3 9,4 9,5 9,6 9,7 http://main.knesset.gov.il/mk/Pages/MKPositions.aspx?MKID=684 — Knesset. ↑ Brenner, Michael; Frisch, Shelley (April 2003). 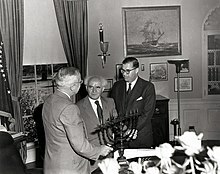 ↑ Teveth, Shabtai (1985) Ben-Gurion and the Palestinian Arabs. From Peace to War. Oxford University Press. ISBN 0-19-503562-3. Ezra – pp. 3, 4; Paolei Zion – p. 6; central committee – p. 9; populations-pp. 10, 21; Galilee pp. 12, 14–15. ↑ Benny Morris (2008), pp. 315-316. ↑ 36,0 36,1 Benny Morris (2008), p. 318. ↑ Yoav Gelber, Israeli-Jordanian Dialogue, 1948-1953, Sussex Academic Press, 2004, p.2. ↑ Ari Shavit'Survival of the fittest, ' Haaretz 8 January 2004:"The worst cases were Saliha (70-80 killed), Deir Yassin (100-110), Lod (250), Dawayima (hundreds) and perhaps Abu Shusha (70). There is no unequivocal proof of a large-scale massacre at Tantura, but war crimes were perpetrated there. At Jaffa there was a massacre about which nothing had been known until now. The same at Arab al Muwassi, in the north. About half of the acts of massacre were part of Operation Hiram [in the north, in October 1948]: at Safsaf, Saliha, Jish, Eilaboun, Arab al Muwasi, Deir al Asad, Majdal Krum, Sasa. In Operation Hiram there was a unusually high concentration of executions of people against a wall or next to a well in an orderly fashion.That can't be chance. It's a pattern. Apparently, various officers who took part in the operation understood that the expulsion order they received permitted them to do these deeds in order to encourage the population to take to the roads. The fact is that no one was punished for these acts of murder. Ben-Gurion silenced the matter. He covered up for the officers who did the massacres."